Willy Wonka would probably have loved Areej Le Doré‘s new Russian Oud. The chocolate and candy magician in Roald Dahl’s beloved children’s book was noted for transforming sweet items into something fun outside of its usual structure. 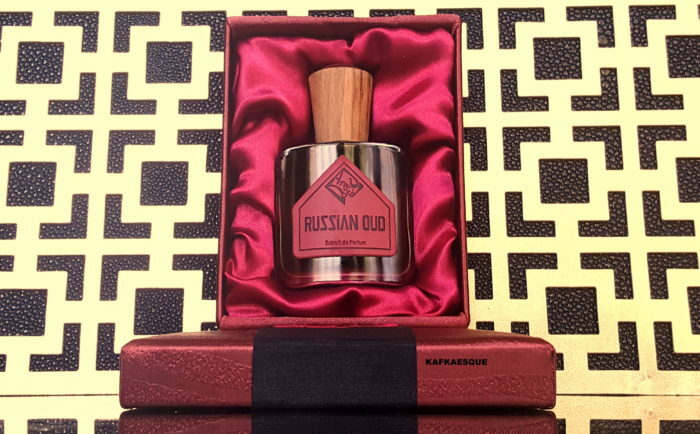 The same can be said for Russian Oud which puts an oriental twist on the famed sweets factory or, to view it in a different light, takes Willy Wonka’s magic factory and places it firmly in the Orient. Imagine Willy’s river of chocolate, but now slash it through with caramel and treacly labdanum toffee and transport it to Ali Baba’s cave of oriental treasures. The cave lies deep in the heart of a Hindi oud mountain, its carved walls emitting gusts of black smoke and heavy brown muskiness. Willy Wonka’s gourmand river now runs alongside tall river beds made out of resinous, smoky red sandalwood and brown-red earthy patchouli, and is watched over by Oompa Loompas clad in birch tar leather, their skin orange from a thin patina of spices, and Ali Baba’s forty thieves clad in myrrh and more leather. Together, they stir the molten river of chocolate, toffee, and caramel with long paddles made out of creamy sandalwood, oud wood, and buttered oud calfskin, sending it down into the heart of the mountain where it finally winds its way into an ambered pool of caramel muskiness flecked with a pinch of cocoa. Russian Oud. Photo: my own.